I hadn't been to Rede for years, although I sometimes thought of it fondly. It seemed to me to be the perfect example of an ordinary rural parish church, quietly sitting here through the decades and centuries at the heart of its little community, with a few scars and survivals to show for the events of the passing years, although not too many, and not too dramatic. And the village of Rede itself is also an utterly ordinary little place, except for one superlative which I shall mention at the end. I came back here on one of the sunny Saturdays of April 2013. Lovely days had been few and far between for months, and so it was a pleasure to turn up here soon after nine o'clock in the morning with the air full of birdsong, open the door and step down into the church. It is an almost entirely 19th Century interior, and not much has happened here since. One curiosity of the church is the number of drop down seats attached to the ends of some of the pews. Those at the east end of the choir stalls are the best, with misericord-style carvings including an agnus dei and a pelican in piety. Some are attached to surviving medieval bench ends, and there is a long one facing westwards at the west end of the nave. I have not seen them anywhere else, so it must have been a local enthusiasm. Perhaps a late 19th Century village carpenter had the skill, ideas and time on his hands to make them. They can't have increased the capacity of this little church by much. There is a pretty pipe organ, and an interesting east window which remembers George Hastings Turner, who died in Bombay in 1879 on foreign service. One panel depicts Hastings Turner himself being received into heaven by St Peter, looking much older than his recorded 23 years, while another shows the story from the Second Book of Kings of Elisha bringing the Shunammite woman's son back to life, a most unusual subject. The exterior restoration was a good one, and kept the mysterious faces staring out from the ends of the west gable. One appears to show a lion, while that facing north looks like a cat with a man's face, or perhaps a man with cat ears. The porch was added as part of the 19th Century makeover, and it is interesting so see quite how eroded the projecting angels have been by a little more than a century of coal smoke. To the west of the porch is a little wooden cross which remembers Kathleen Chidley. She was last head-teacher of Rede Voluntary School 1920-34. She died in 1934, and the school closed soon after. And that superlative? 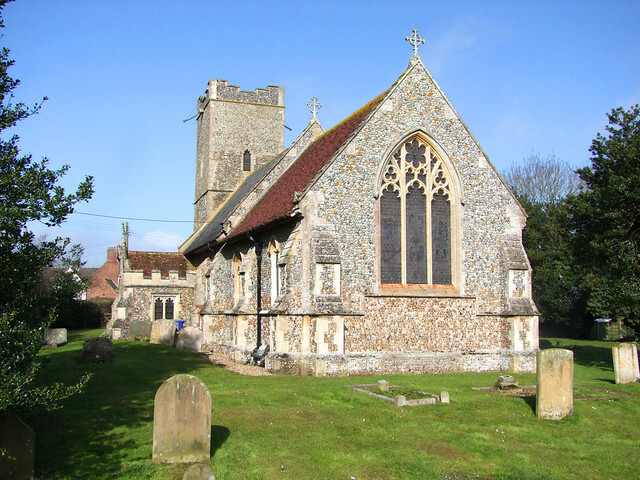 Well, our county's parish churches are largely Low Church in character, but there is one sense in which it can be said that All Saints is the highest church in Suffolk. This is because the parish of Rede is the county's highest point, and if you were to stand at the top of the tower you would be higher than anyone else in all Suffolk, and Norfolk too.